A controversial decision to ban street furniture from Monmouthshire's towns looks set to be scrapped. 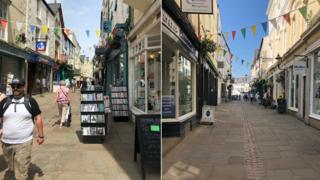 The move was criticised by business owners, with 3,320 signing a petition saying it destroyed the "colour and vibrancy" of Monmouth's Church Street. Council bosses said they wanted to make towns more accessible to wheelchairs, buggies and the visually impaired. But after a backlash council leaders said they are minded to reverse the decision. The new rules - which came in last month - banned items such as tables and chairs, fruit and veg stalls, advertising boards and potted plants from outside businesses. To have these, traders would need to prove they were "safe and secure" and then pay hundreds of pounds for permits. On Monday the council's cabinet said it was minded to scrap charges for the permits. Shop owners will still need to comply with safety issues - but will not pay a fee for putting out street furniture. "The policy giving the council control over street furniture will go ahead but we will ask officers to find other ways to meet the costs," said cabinet member Bryan Jones. The council's deputy leader, Bob Greenland, said the change of heart followed representations from other councillors in the county. Mr Greenland said the cabinet recognised that in very difficult times for town centres, even modest charges "might be the straw that broke the camel's back" for traders. The original decision over street furniture led to some businesses in Monmouth refusing to pay a permit charge, and some threatened to close their shops in protest. The council's deputy leader said the matter would now be resolved at the next available cabinet meeting, when the feedback from council members and scrutiny committees would be considered.